Texas’ empty expanses boast incredibly dark skies. They also shed light: literal photons from distant heavenly bodies, yes, but scientific discoveries and realizations about our own smallness as well. At McDonald Observatory, we chased enlightenment under a blanket of stars. About 100 billion stars twinkle in the Milky Way, which itself is one of roughly 100 billion galaxies in the known universe. But numbers alone can’t convey the grandeur of those facts. Sometimes you just need to go outside and look up. 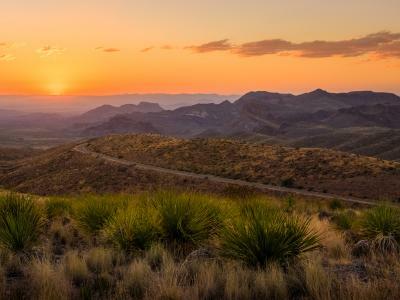 For that, nothing beats Texas’ big sky, which stretches vast, deep, and dark. We stopped at McDonald Observatory in the Davis Mountains for an unmatched glimpse of the cosmos. 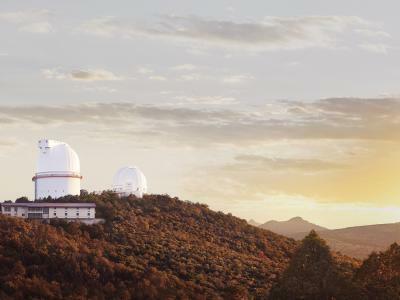 The drive up to McDonald Observatory, a world-class astronomy facility perched on Mount Locke and Mount Fowlkes, felt like a tiny pilgrimage. As the road rose in elevation and the telescope domes grew larger in view, our anticipation mounted. The destination more than delivered. 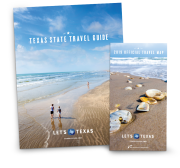 Owned and operated by the University of Texas at Austin, the property includes five research telescopes of various sizes and uses. The largest, the 433-inch Hobby-Eberly Telescope, is used to search for planets around other stars and study far-flung galaxies, exploding stars, black holes, and more. Here, astronomers make discoveries that nab headlines and alter our concept of the universe. One researcher was part of a team that recently found an 11.2-billion-year-old solar system with a Sun-like star and five Earth-size planets. The discovery carries implications for the chances of ancient life elsewhere in the galaxy. You know, just a normal Tuesday at McDonald Observatory. The beginning stargazer can find riches, too. Daytime tours and solar viewings are available every day of the week; Star Parties open up access to telescopes every Tuesday, Friday, and Saturday evening; and the Twilight Program, a session unfolding before the Star Party, regales visitors with lessons about the planets, the Sun, and the Moon. We did all the above. Opting for the daytime tour at 2 p.m.—there’s also an 11 a.m. session—we filed into the multimedia theater of the visitors center, where a guide kicked things off with a magnificent solar spectacle. Using specially filtered telescopes that ensure safe viewing, he walked us through the Sun’s features, past and future. The presentation was riveting, from the explanation of sunspots, which are relatively cool points on the solar surface, to the account of the Sun’s sad, bloated decline—which will span billions of years and leave Earth a drifting cinder. Next came a shuttle bus drive to Mount Locke and the 107-inch dome of the Harlan J. Smith Telescope. Among its many functions, the instrument has been used to refine measurements of the Moon’s distance from Earth, to test Einstein’s theory of general relativity, and to study the compositions of remote stars. This location also let us enjoy the horizon. At an altitude of 6,790 feet, the mountain provides a panorama of the surrounding mountain landscape, which extends beautifully, peak after peak. Our guide explained how the altitude and seclusion provide protection from civilization’s light pollution, making for strikingly dark views of the night sky—indeed, some of the darkest in the country. The Star Parties are probably the most buzzed-about aspect of a visit to the observatory. The thrice-weekly telescope events draw an average of 89 visitors per night in January, its slowest month, compared with 451 in March, when special spring break programs attract big crowds. Visitors can attend the pre-party Twilight Program, a roughly hour-long talk. Some nights feature an excellent overview of Moon phases, eclipses, and features. On nights where the Moon is elusive, the program includes a live scale model of the solar system, in which audience members play the role of the planets. My show-off companion was Saturn. The Star Party began afterward, opening with a short spiel that covered the “no light” policy. Cell phones, cameras, even kids’ LED shoes can create ambient distractions and keep our eyes from adjusting to the dark. Sure enough, in the pitch-black of a Big Bend night, it took a minute for our swath of the universe to fully reveal itself. And when it did—wow! An uncompromised night sky is like nothing else on Earth, enough to make you buckle at the knees. We could see the Milky Way, gauzy clusters of stars, faint meteors, and even man-made satellites arrayed in awesome detail. With about two dozen telescopes dotting Rebecca Gale Telescope Park, we took turns waiting in brisk lines while guides peppered us with facts. When it was our turn at the eyepiece, we got eyefuls of Mars, Saturn, Uranus, constellations, and galaxies—so many things, named and unnamed, that gave us a faint, powerful hint of what 100 billion times 100 billion means. The Hobby-Eberly Telescope is part of the first major project to search for dark energy. Making up 70 percent of matter and energy in the universe, dark energy is the mysterious force behind the universe’s expansion. HETDEX, the Hobby-Eberly Telescope Dark Energy Experiment, will map 100 million galaxies that are nine billion to 11 billion light years away—the largest map of the universe ever produced.